The winter season is typically long, cold and gray in central New York. Through this long cold winter season, fly-fishing is without any major insect hatches. The other three seasons are graced with some beautiful hatches possibly starting with the Hendrickson’s in the spring and ending in late fall with caddis flies and olive mayflies. Through the winter, just the sight of an insect can give the bright optimism of spring and create a vision of the season to come. When the majority of fly-fishers think of hatches, the first type of insects that come to mind are the delicate mayflies, which are synonymous with the sport. In central New York mayflies are not the first insects to hatch. 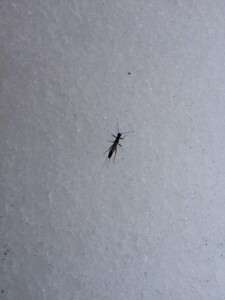 Every year, when there is a wintertime thaw or on a sunny day in late winter or early spring, little black or brown stoneflies begin to emerge from central New York streams and rivers . 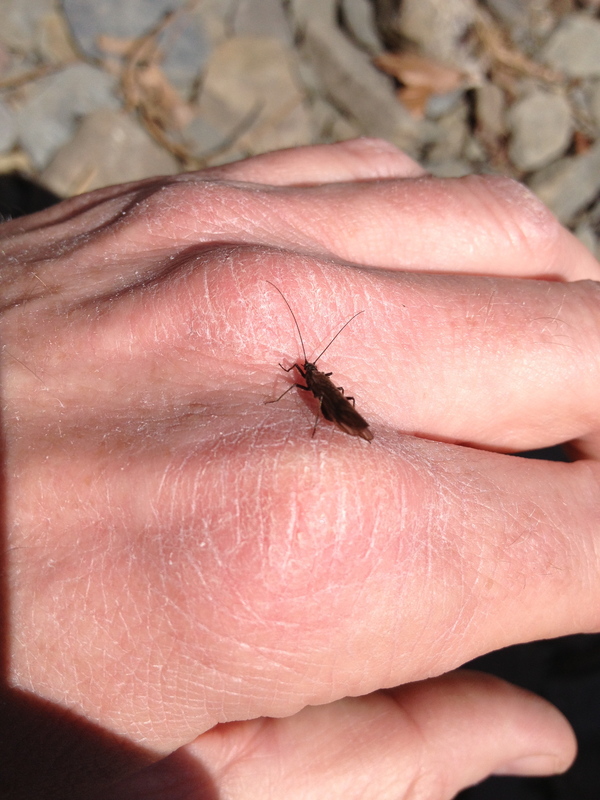 These insects can be seen on various streams throughout the region including Finger Lakes tributaries, Lake Ontario tributaries and various other inland streams. The best and easiest place to see them is on a snow bank. If there is still snow along the stream banks when they hatch, they are easily observed. Their black/dark brown bodies against the white snow make them stick right out. If the snow is not there, looking at some bushes, trees, boulders or any other structure along the stream banks on a warm day is the next approach to spotting them. Some days they can be seen flying after they have dried their wings and then you know the hatch is happening. The fishing can be productive with stonefly imitations during these early stonefly hatches if there is a heavy enough hatch and the fish key in on the insects. Imagine that the immature forms will become dislodged from the underwater rocks from which they emerge and will attempt to swim and become available to trout. Stoneflies do not emerge like most mayflies and caddis, but on the contrary will swim and crawl along the bottom of the stream until they reach the edge and then they will crawl along the rock bank to dry their wings and prepare for flight . Often times the water temperature is warm enough for them to hatch but air temperature is still cold so the wings will not fully develop, which is interesting to see as they crawl across the snow with the wings still in the wing case. 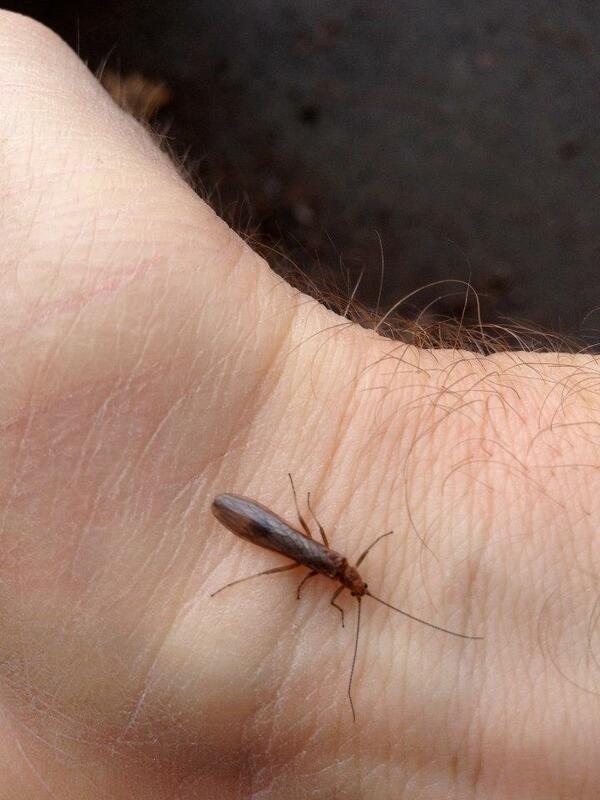 Since stoneflies are crawlers and are not available on the ascent from the water like many aquatic insects associated with trout fly fishing, it can be easy to miss a small hatch. My success with little black /dark brown patterns through the winter into the spring is enough to convince me that the trout are focusing on these insects. If your lucky and adults emerge but fall back to the waters surface, trout may feed on the surface. 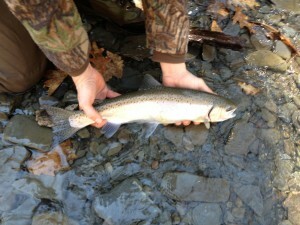 This can be the first dry fly action of the season in central New York. A semi-deep slow presentation will be essential during these early hatches due to cold water temperatures and to mimic the crawling behavior of these little stoneflies. Don’t neglect letting the fly swing at the end of the dead drift as fish are sometimes triggered into the bite by the movement of the fly across their field of vision. This is always the best way to hook a fish!! This one has been deadly on the West Canada in the winter. I have used this pattern to take browns, steelhead and landlocked salmon. This is a good winter steelhead fly.